Ever wonder what happens to the red fire engine upon retirement? "Most decommissioned fire engines probably end up on the scrap heap. Some, however, are done up at companies like Ziegler Brandweertechniek in Winschotenand and sold on... Customers in Africa and South America usually buy the engines through agents. 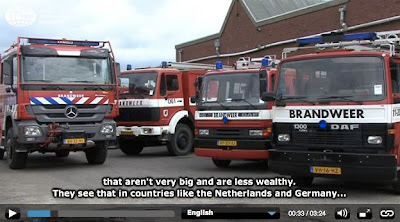 But recently, two firemen from Lomas de Zamora, in the Argentinian province of Buenos Aires, travelled all the way to the Netherlands to negotiate a deal. "I feel like I am in Disneyland," said one when he saw a Volvo being repaired. According to fire chief Daniel Vicente, after an extensive inspection of two Merecedes-Benz engines with less than 30,000 km on the clock, the two Argentinians agreed: "We are buying!"